Saturday January 13th... The Pits opened up just after 9am and racers started showing up to check out one of the club favs - the revived Acme Raceway. When we were all accounted for, there were initially Eleven racers ready to test their Fray racing skills once again on Willey’s old track. Carl E. and some of the other TRAC racers made a couple of good improvements to the layout. As usual, we had representation from all three Southern California Fray Teams. The racing schedule was to feature two - timed 3 minute heat round robins after an initial practice round. The practice round finally got under way and most of the racing was very tight. The red lane was the toughest. It was no surprise that RICK JOCHAM laid down a solid 21 laps to give us all a feel for what could be done…GREG WILLEY was able to remember his way around the circuit and also clocked 21 laps on red. MIKE ENGELAGE and RICK J bested the crowd with 23’s on the white lane. MATT PAUL also brought a couple of nice rigs to the party and kept pace with the leaders. MIC WAS consistent with 22’s across the board but had difficulty on red and was only able to post a 17. When the dust settled, it was JOCHAM in first place with 90 laps including a massive 24 on blue! That’s a solid average of 7.5 seconds per lap!! RICK was followed by MIKE E. with 87 laps, followed by MATT PAUL with 85 laps, GREG WILLEY was next with 84 laps, MIC followed with 83, SCOTT DUNLAP driving a fast rig was next with 81 laps. TOM GIESE also had 81 laps but was just behind DUNLAP on track position. VICTOR LICAUSI was next at 80 laps followed by CHRIS (ACTION) JACKSON with 79 laps. Our host CARL TINUCCI clocked in with 78 laps and bringing up the rear was SCOTT ELLIS (making the trip up from San Diego) also with 78 laps having realized after the round that a rear tire was coming off the hub. ROCKY GERMAN made the trek in time to start the featured heats and made our total twelve. ROC also had some of his spiked rum cake in tow, which many decided to enjoy. We got under way with the first round robin after switching the practice rotation from Straight to European. The racing improved, and there was some shifting in the standings. RICK J. laid down 23’s on all but red where he posted 21 laps and ended up with 90 laps again. MATT PAUL brought the heat and clocked 23’s on white & blue ending up with 89 laps. MIKE ENGELAGE posted 22’s and 21’s but one of the 21’s was on the white lane and finished with 86 laps. GREG WILLEY and SCOTT ELLIS (having fixed his traction control problem) also posted a couple of 22’s and both ended with 85 laps for 4th and 5th respectively. MICKEY HURTADO was also able to clock a couple of 22’s (blue and yellow) finishing with 84 laps. SCOTT DUNLAP was able to also post 22’s on yellow and blue ending up in 7th with 83 and beating ROCK GERMAN, also with 83, on track position. VICTOR LICAUSI was consistent and laid down 21’s on three lanes but could only get 19 on red finishing with 82 laps and 9th place. TOM GIESE was also consistent but slowed a bit from the practice round and ended up with 80 laps and 10th place, he was followed by CHRIS JACKSON with 79 laps and then came host CARL TINUCCI with 78 laps. All in all, pretty tight racing. We decided to take a short break (except for MIKE E. who brought out a secret weapon – an Eye Loop;-) – and continued to work on his rig). Carl provided an awesome lunch spread of pizza, wings, fries and drinks. Rockies cake provided dessert and a nightcap J. Fray Prep at the Dunlap motorplex yielded surprising results. Ty, who provided the impetus to get this show on the road brought up Gene Bellegarde and Francis McEntee from the San Diego area. Local Inland Empire guys, Rob and Kyle Bowman, Mic and Jeremy Hurtado, Chris "Action" Jackson and body fabricator Greg Davis were there. Mike Engelage and Rick Jocham got there early and Tom Giese made the long drive from Santa Clarita. With this being the evening that the Patriots of New England may set an NFL record, I chose to bring a small portable TV set to watch the momentus occasion unfold. It kept one racer from leaving early and New England pulled it off in dramatic fashion. Qualifying got under way at 6:00 pm and Lanemaster got the whole event set for us. There were a couple of proxy qualifiers, including Rocky who was seeded in 6th. Unfortunately, car problems prevented Rocky from making the trip over. Tom was TQ with a run of what I recollect to be a lap of 8.2 seconds. Lanemaster got us set in 4 consis of 3 or 4 racers. We ran off the first round and top guns were Mic, Tom and possibly Scott, all at 52 and 53 laps for an average of 13+ per heat. Lanemaster then broke the top 8 into 2 semis of 4 racers each. Tom dominated this round with a 53 lap finish with Mic, Mike and Scott hot on his heals. I think that Scott may have gotten 53 as well. The finals were set for a shoot out and with last lane choice, Mic was elected to run the center lanes first. He took advantage, running 13 and 14 in orange and blue and took the early lead. Everyone remained on the same lap, as near as I can remember. In the third heat Tom asserted his already established dominance by taking over the lead with Mic in hot pursuit. In heat four Scott got by Mic who ran the tough green lane to finish as Tom, the Zen Master, pulled away. The finish was Tom in first with the first 54 lap run. His chassis was built by him and featured a Moonstone GT Ford body. Scott, our host took second running is own chassis and his own Mitsubishi Eclipse body. Mic rounded off the podium in third with his own chassis under one of Greg's R8 Audis. Mike had an awesome run in fourth, on the same lap as 2nd and 3rd place at 53 laps. He ran a Jocham special chassis under a pink Greg Davis Alfa Romeo 156A. Thanks to Ty for rattling my cage to get this fray show on the road, Scott Dunlap for hosting us all and Jeremy Hurtado for accompanying me for moral support and picking up our part of the tab at the Outback Steakhouse. I promised I'd pay him back. Next race is on Willey's Acme Raceway at Carl's place in Glendora on Jan 12th. I hope to see you all there. Let’s see, I should start with giving props to everyone responsible for making this happen. The top of the list would be my brother in law, Scott. He brought out his Dodge pick up and we loaded the 2 tracks up and brought them over on Saturday night. My daughter, Elyse ran the race program for us. Saturday night Scott Dunlap, Matt Paul, Carl Tinucci and Chris Jackson helped me get the tracks prepped. Chris ran power over from the Actron power source which ran both tracks while we set up. Matt brought over his drive and we ran the red track off of it. My Dad provided beer to those who chose to partake and had filled the fridge on the patio with water and soda for the conscientious objectors. Sunday morning I arrived just after 8:00 am and was surprised to find none of the usual early birds. I put a few finishing touches on the track and got Elyse a table set up to run the program and tracks from. The first person didn’t actually arrive until 8:45 or so. It may have been David Anderson. featured one of my original Tuff One Javelins shod with JW white Tuff One hubs and Dennis Rutherford’s white silicone slip ons in the red lane. The white lane had an original Tuff One Chaparral with the old screw on hubs from the AFX hop up kit and cut down slip ons. The blue lane ran an original white Lola with .225 hubs and full size Heister slip ons. Yellow had a white Model Motoring ’69 Z/28 with white .225 hubs and cut down slip ons. All of the chassis were old chassis from the fray days of yore. The Chaparral front end was one I made, as a kid, from brass tubing with springs and original skinny hubs that were pinned in place. I forgot to check with Matt who deemed the chassis too slow and used the phrase “specially prepared” in a somewhat mocking manner on a couple of occasions during the race. It seems somehow ironic how Matt seemed displeased about incessant complaints about track conditions from one of our racers when he first started running with us. Remember the gas smell in someone's garage? He has now become the incessant complainer about something at every race. That's just a personal observation. Correct me if I'm wrong. Everyone else seemed pretty content with both classes of IROC races. In summary we need to congratulate David on what was his first fray win on a track he didn't own. Ty was the victim of a slight marshalling lapse in the fray on blue but managed podium spots in every race. Scott and Mic did their best to guarantee neither of them would reach the top step of the podium in the fray on blue. All in all it was a really fun day of door banging with Scott. My mom says their place is always open for future race dates. I hope to see some of you over at Chris' place on the Red Hill road course this Saturday evening for a little test n tune. Matt, I love you man. I'm sure we won't be sharing Bud lights any time soon, I could just do without some of the bickering. You are definitely one of the guys I want to run against everytime we have a race. Keep bringing the speedy cars and sense of humor. Scott, you were awesome in the IROCs and Tom did very well too. Francis, I promise to have your ride set up better in the next race over at Chris tomorrow. Thanks to everyone who made it out. After some deliberation, we decided to run one more round robin and call it a day. I chatted with Rene’, who I discovered a few weeks ago owns a Bowman built Champion Raceway. We may get to run a fray race on his track in the next month or two. Our final round finished as shown. Again, Tom and David, owner and former owner of this layout showed the way. Both drove Jocham powered cars. Encouragement and wishes of good luck were given to Michael as we loaded up for the trip home. Many thanks to Tom, for opening up his place to us. The dominance of Tom and David left nothing but scraps for the rest of us. Overall the day was just an average day of racing here in So Cal on one of the Dunlap Motorplex creations. Those who missed it, missed out on a good time. I look forward to going back to Tom’s again some time. I heard that the egg rolls were very good. The abundance of iced down drinks was great and very needed. Thanks again Tom. A little controversy, in reference to where we’d race and on what type of track, helped the tuning juices flow for a few of the combatants in this event. We ran at the Dunlap Motorplex on Scott’s first venture combining landscaping and the freeform design that Scott’s become so famous for. Scott incorporated some track pieces that didn’t make any of his previous layouts, then made sure it all lined up. If you haven’t seen the pictures, you need to take a look. This track features a pit exit, from the green lane and is, aesthetically, a piece of work. Scott’s recently painted FISA type curbing to add more of a visual enhancement. It was like driving on a real track, complete with buildings, picnic areas, and a bad accident on the curve heading towards the bridge. The format would be a large round robin of 3 minute heats, followed by lunch. Then a second round robin that would seed a final ladder type move up opportunity. We had enough to start with a D main that allowed 2 drivers to move up and each subsequent main allowed only the top driver to move up. This set up our ladder main. This round was just 2 minute heats allowing each of the drivers to run all 4 lanes and try to make the move-up. The D main had Rob, Carl, Willey and Rocky in it. Rocky and Rob made the move-up. The heat results were lost before we had a chance to record them. The C main had Tom, Francis, Rob and Rocky. Frances took it with 49 laps. Rocky ran 48, Tom and Rob had 46. Frances went up against Scott Dunlap, Scott Ellis and Ty Brittain. Francis took it again, for his second move-up into the A main. He ran 47 laps and the rest were deadlocked at 46. The final pitted MP Racing with Matt Paul and Mike Engelage driving against the IEHO Garage with Francis McEntee and Mickey Hurtado at the controls. Matt took the honors with 52 laps, a main high count for laps. Mike was just short of 52 with a 51 lap count and had Francis along side, one lap down at 50. Mickey was passed for position in the last heat by Francis and finished just a few inches behind Mike and Francis. It was an awesome run for the guys. The B and A mains had very few wrecks. Mike Engelage was a welcome sight, back on the scene after a hiatus. It took awhile for him to shake off the rust. Congrats go out to Matt for building some awesome cars. They were quiet and fast and there was no pass and crash today, as Matt was on a mission. Mike and the IEHO guys just held on for dear life. Matt built it, brought it and finished with flying colors. Next race will be at Saugus Speedway. Thanks to Tom for inviting us out. I hope to see you all there. Saturday April 21st... The garage doors rolled up just after 8am and Gene Bellegarde was first to show up and immediately began to assist with getting the track and facilities ready for the day’s racing (thanks Geno). When we were all accounted for, there were seven very evenly matched racers ready to test their Fray racing skills once again on the Scott Dunlap masterpiece – Cowles Mtn Raceway. Not our usual showing but we were competing with Eddie Torres and had a couple of club members that had family matters to attend to [our thoughts are with Chris Jackson (very ill Father in Law) & Ty Brittain (emergency back surgery for his wife)]. The racing schedule was to feature two - timed 3 minute heat round robins. The first would be a preliminary round and the second would be our final. In the first round robin, most racers were laying down laps of 23 to 26. However, there was an occasional 27 being thrown in. When the dust settled, it was host SCOTT ELLIS in first place with 106 laps followed by MATT PAUL with 104 laps, followed by FRANCIS McENTEE beating out MICKEY HURTADO by less than half a lap. They both had 103 laps (who says track familiarity doesn’t count for anything?). MICHAEL HURTADO was next with 101 laps, followed by Gene BELLEGARDE with 98 laps and finally RON STOCK with 95 laps. There was a lot of very tight racing with not much need for marshalling during that round. We decided to take a short break, had lunch, discussed everything under the sun and got ready for the final round. In round 2 (and final), the usual improvements in lap times and counts happened once again! Scott Ellis was first again with an identical 106 laps. However, Mickey H. ran very strong in the final by over taking Matt P. but coming up just short with 105 laps for second place. Matt Paul was third posting another 104 laps followed by Francis McEntee also improving to 104 laps but losing out on track position to Matt P. Michael Hurtado and Ron Shartau were next both having 102 laps with Michael H. having track position. Gene Bellegarde was next with 97 laps after changing cars for the final. As you can see, this was a very evenly matched group of racers. Thanks to all the guys who came out for the race. Rocky made an awesome return with his MP racing rig. There’s no one who I could think that I would rather finish 2nd to, except maybe Michael, or someone else driving an IEHO powered car. Scott Ellis’ rig was powered by Jocham power. 4th and 5th had MP racing power and 6th was also IEHO powered. The next race is scheduled for Scott Ellis’ lair in San Diego, California on my second favorite Dunlap Motorplex track. The firm date will be posted on the front page of my site. It was about 3:00 pm and we discussed running an elimination/move-up round, but called it a day to allow some of the guys who had made a long drive the option to get home early. RonStock was prepared to pay out the bounty he had offered to the top drivers and top team in the IEHO vs San Diego match up at the fray. With the absence of anyone from San Diego, he decided to wait until another time. Most of the guys stayed for awhile longer running laps and enjoying some track time and friendly conversation about the fray and the rest of the Spring series. I will not coordinate the rest of the Spring series so that I can get my long neglected home redecorated and presentable, by my wife’s standards. She’s been a real trooper, allowing us to race there with the place as run down looking as it has become over the 20+ years we’ve lived there. The lack of communication over what the group wanted to run and discovery that slip-ons weren’t the ticket made my decision to take a break easier. I’d have loved to run fray cars again, if I had been told that from the start, some 2 months ago. Some folks just chose to not say anything until 3 or 4 days before the race day. With the time I had already invested in publicizing the series with posts on my site, communication with the guys from AZ, who planned on attending in April, and multiple attempts at trying to get some input, with little to no feedback, I chose to do right by my family and invest the time in them and their well being. I had already given over and above the call of duty, took potshots and…blah blah blah. I’ll make some local test n tunes and provide cars for my drivers, should someone decide to take the helm and fill in the blanks for the race dates that are left. I’ll be back in September to head up the Equinox in the Empire event scheduled for the Comfort Inn banquet hall again like last year, as well as the fray prep series. I’ll continue to maintain the site and post any race information that is forwarded to me. Well, first I thought I should shed some light on how we got the name, The Pound. When I first started wiring up David’s old Scenic 70 Tomy magnet car track, I kept referring to it as the LB (for Long Beach) magnet car track. With LB the abbreviation for pound, the transition seemed quite natural to me. Racers began arriving at the prescribed 9:00 am pit opening and the talk was of the cold and the fact that So Cal was experiencing an unusually cold couple of weeks. David met us out front and was finishing getting everything in order for the arrival of the racers. There was some obvious nervous anticipation on David’s part. This would be David’s first as the part of host. His new place was very racer friendly with plenty of room to pit and the whole 1.5 car garage to house the track. David had a small area heater and multiple drop lights that doubled as not just sources of heat but as illumination for the track. It had hit below freezing temperatures the night before and the So Cal contingent isn’t used to these extreme temperatures. Many thanks go out to David, his TM (track manager) Caroline and the kids for having us over. Caroline was putting the finishing touches on a large pot of soup as we welcomed ourselves into their abode. Practice quickly ensued and we waited for people to get their cars set up just right for the Dunlap Motorplex routed track that David had just acquired. We jumped into round one and ran one big round robin with all 12 drivers in it. Our newest racer was Liam Anderson and he is officially the youngest driver to run with us in one our fray prep races. Liam is 5 and ran an IEHO prepped Greg Davis bodied 550 Maranello with a VRC controller. Liam did very well for his first time out and David says he really enjoys running the fray cars. Liam’s obviously got some skills. I look forward to seeing him at more of our races in the future. I love hearing him talk to Mom in German. At 5 years old he’s already bilingual. I can't forget to mention special thanks to Jeremy Hurtado, who made the trip down to the pound just to run the computer and the race program for the day. Thanks a bunch Jeremy. The results from round 2 seeded the drivers for a main pitting Liam, Willey Chris and Matt to drive off in a fray style 10 lap sprint. Winner gets 4 points, 2nd place 3 points and so on. The highest scorer after everyone runs all 4 lanes was a tie among 3 drivers with 12 points each. Willey won 2 heats, the others only 1 each. Willey moves up to the next main against Tom, Mickey and Michael. Michael walked away with 4 straight wins. The senior Hurtado was next best at 10. Tom finished with 8. Wiley scored 6. Michael was up against Scott, David and Greg. The top 2 scorers in this round would run against Mike and Rick in the final. Greg scored highest with 14. Michael scored 11. They moved up. David scored 8 and Scott had 7. So it would be Greg and Michael from the B main, against Mike and Rick. Mike ran Rick’s hot rod in this second round. Rick ran a pos (joking, but not really) he borrowed. He later upgraded to something out of his box. Mike had a near perfect score. Michael stole one away from him and was second with 10. Rick scored 9 and Greg had 6. I like this format. You get some more driving and it’s a good lead in to the fray. Thanks again to David and to all of the racers who braved the cold. Liam, great job. We hope to run with you again. I spoke with Chris, and he's agreed to hold the last fray prep day at Action Speedway with the lock and joiner and the routed track open for racing. Once all are there, we will decide if we want to run a race or just a testing and final tuning session in prep for our quest for the fray. Thanks to Chris and Cynthia for allowing us to invade their space for the 3rd time in as many months. Saturday December 16th... The garage doors rolled up just after 8am and racers started showing up and grabbing the prime pitting spots. When we were all accounted for, there were twelve racers ready to test their Fray racing skills once again on the Scott Dunlap masterpiece – Cowles Mtn Raceway. As usual, we had representation from all three Southern California Fray Teams. The racing schedule was to feature two - timed 3 minute heat round robins with. The laps would be added together from the round robins for seating in the championship round which would be run Fray style (10 lap heats). In the first round robin, most racers were laying down laps of 23 to 25. However, there was an occasional 26 or 27 being thrown in. When the dust settled, it was track builder SCOTT DUNLAP in first place with 104 laps followed by TY BRITTAIN with 103 laps, followed by RICK JOCHAM, MATT PAUL and host SCOTT ELLIS all at 101 laps. GREG DAVIS and FRANCIS McEntee both had 100 laps with MICHAEL and MICKEY HURTADO coming in with 98 laps, VICTOR LICAUSI was next at 97. TOM GIESE was next with 96 laps and CHRIS JACKSON had 94 LAPS. We decided to take a short break (except for SCOTT DUNLAP who went back to his pit and decided to build another rocket) and go right into the second round robin and race until Scott E’s lovely wife SUSAN showed up with lunch. In round 2, it was obvious that the racers were becoming more familiar with the track’s layout as lap times started going down and lap counts began to climb. JOCHAM finally tuned his sled just right and laid down a whopping 108 laps. TOM GIESE also racing a re-tuned Jocham special was next at 105 laps. That was a seven lap improvement over round 1 – Tom continues to show he’s come down a steep learning curve and plans to be a force in the club. DUNLAP and BRITTAIN were next with 105 laps each followed by SCOTT ELLIS with 104 laps. MICHAEL HURTADO was next with 103 laps followed by MATT PAUL & GREG DAVIS WITH 102 laps each. FRANCIS McEntee and MICKEY HURTADO both had 98 laps followed by CHRIS JACKSON at 96 and VICTOR LICAUSI (who had a couple of really good cars) at 94 laps. We used the lap totals from round 2 to break any ties…when the lap totals were added together it was JOCHAM and DUNLAP both at 209 laps and advancing to the Final, followed by local racer TY BRITTAIN at 208, then ELLIS with 205. Next was MATT PAUL with 203, DAVIS with 202, TOM G. and MICHAEL H. with 201, F. McEntee with 198, MICKEY H. with 196, VICTOR L. with 191 and ACTION JACKSON with 190 laps. We finished lunch, made final adjustments to our cars and prepared for the very difficult Fray Style Championship Round. The Championship Round would be two quarter final races with one racer from each moving into a semi-final race against BRITTAIN & ELLIS. Then two racers from the semi-final round would move into the Final against JOCHAM & DUNLAP. The 1st quarterfinal matched Francis McEntee, Mickey H, Licausi. and Jackson for the prized move-up. Licausi finally seemed to get it together and won three of the four heats for 14 points and moving up to the semi-final. Jackson had three seconds grabbing 10 points followed by Francis McEntee and Mickey both at 8 points with Francis having won one heat and taking third place. The 2nd quarterfinal matched M. Paul, Tom G., Greg D and Michael H. for the last coveted move-up. It was M. Paul finally putting it together and taking two of the four heats for 13 points and moving up. Tom G. and Greg D. both had 11 points with Tom having being slightly more consistent than Greg followed by Michael H. who never seemed to have his usual strongly prepped IEHO car this day. The semi final was set… Brittain, Ellis, Licausi and Paul were ready to battle for two prized move-up spots and a chance at Jocham and Dunlap who both needed NO extra tuning time! When the semi final round got going, host Ellis took no chances, had some luck staying out of trouble and won all four heats, grabbing a perfect 16 points and the first move-up. Next was fellow Team San Diego driver Paul with 10 points and a move-up followed by IEHO teammates Licausi and Brittain with 8 and 6 points and finishing 5th & 6th respectively? It was Brittian who seemed to have had bad luck in the semi-final and finishing the day in sixth place. Ty had a very strong car all day. The Final was set…Jocham, Dunlap, Ellis and Paul vying for king of the day! When the final round got under way, it was Jocham and Dunlap battling for 1st and 2nd. When the dust finally settled, it was Jocham in first place with 13 points, Dunlap in second place with 11 points, Ellis in third place with 9 points and Paul in fourth place with 7 points. The next race will be at San Gabriel Raceway in Covina, CA. It’s Matt’s place, where he is characteristically strong. The silly season is in full force as the So Cal teams jockey for new members and a new alignment. Nothing has been set in stone, only speculation, with the founding of the new Inland Empire team. Rock Island/LA now appears to be defunct as members of its team, Mickey Hurtado, Michael Hurtado and Vic Licausi are the foundation for the IEHO team. Ty Brittain, former founding member of the San Diego team, will join the new Inland Empire team. The rest of the team is yet to be determined. The So Cal team and San Diego team are still in a state of change and I’ll give their line ups as soon as they’ve been determined. Chris Jackson has acquired the Bowman routed track previously owned by Gary Patton, a former So Cal team member. Acquisition of this track puts the Southern California group in a prime position to be very set up for the Bowman routed tracks up at the fray. Chris has committed to hold the December 2nd race at Action Speedway, and will feature the introductory race on the former Arlington Raceway. It will be a B.Y.O.L. (bring your own lunch) affair. There are many fast food joints within a close proximity of the Action Speedway in Upland, CA. I’ll report on the race at the San Gabriel raceway as soon after the race as possible and assure that I get accurate and complete results prior to leaving Matt’s place. The morning was beautiful in the foothills of Upland, California. Racers began arriving about 8:30 for the second fray prep race of the TRAC (Thunderjet Racing Association of California) season. The venue is a six lane lock and joiner facsimile of the blue track up in Ferndale, California. 13 drivers rolled in and by 10:30 am we lined up for a quick tech involving a check of width and weight. IEHO made some changes to bring up our cars to the 20 gram minimum. Everyone else adjusted front axle keepers or pushed in rear tires to get under the 1.3125” max width allowed. For a change of pace we ran qualifying laps for a minute in the orange lane. It was immediately evident who were contenders and who were pretenders. TQ was Michael Hurtado in his IEHO prepped Moonstone Mustang with a lap of 9.229. Matt Paul with his MP racing Toyota was 2nd @ 9.245 and Ty Brittain rounded out the top 3 with his IEHO prepped Enzo @ 9.254. We went into a round robin of the top six qualifiers with fray style scoring. That was followed by a second round robin of the lower qualifying seven drivers. The overall results were surprising, not that Scott Ellis from the San Diego team took the top spot with 33 points, great job Scott, but that our newest racer, Tom Giese ran his IEHO prepped Alfa to a second overall spot with 26 points. Greg Davis and Doug Brown, both So Cal drivers, were tied at 25 points with Doug getting the nod with his higher qualifying position. Mickey Hurtado was fifth with 24 points and then Ty in a 3 way tie with Chris Jackson and Francis McEntee at 21 points got the sixth spot with 21 points. Chris Wife, Cynthia treated us to a delicious buffet of tacos with two choices of meat and all of the fixins. Thanks so much to Chris and Cynthia for having us and for all of their work prepping the track. Mickey, Cynthia and Chris spent about 14 hours peeling off the old lane marking tape and applied ¼” round circles, cut in half to each and every lane of each and every piece of lock and joiner in Chris’ layout. The results were very clean looking and there were no problems marshalling as the lane color indicators made it very clear what the lane colors were. The afternoon race was run as timed heats of 3 minutes in each lane and each driver picked up where they left off on the last lane they ran. Drivers came in on the toughest blue lane and exited on red making it a straight rotation across the track from left to right. This was a bit more grueling than the 10 lap and done race from the morning. Rick Jocham had joined us for the afternoon race. There was a lot of racing action and the marshalling was pretty good all day long with only a couple of marshals caught grandstanding instead of watching their areas. Karma can be a bear, so you guys who were the culprits, better watch out. We ran 2 round robins of 7 drivers and the first group marked their finishing positions until the second finished. The first round had Mickey at the top with 98 laps, Matt was second with 97 laps, Greg, Tom and Ty all tied at 96 laps with Ty taking it, by position, over Greg and Tom respectively. Tom lost nearly a full lap when he hooked up his controller wrong when on the yellow lane. Then came Francis with 94 laps and Kyle with 83 laps. The second round was stepped up quite a bit. Doug Brown took top honors with 101 laps. That’s why they call him the Iceman. Michael Hurtado was on fire and finished with 99 laps. Rick Jocham followed with 98 laps using an experimental car. Thanks for having mercy on us. Then came Scott Ellis with 96 laps, Andrew Davis with 94 laps Chris Jackson with 93 laps and Rob with 89 laps. Mickey Hurtado had to leave for work and missed the finals, which involved the top six from the combined 2 rounds. Rick kicked it up a notch for the win, Doug Brown took second, Ty Brittain took third, Matt Paul was fourth, Michael Hurtado was fifth and Greg Davis who stepped in for Mickey Hurtado was sixth. It was a fun day. I wish that I could’ve stuck around for the fun in the finals, but duty called. The next race will be at Scott Dunlap’s Dunlap Motorplex, just down the road a piece, also in Upland, California. Rick Jocham, Chris Jackson, Mickey and Michael Hurtado will be joining the BAYHOGGs at SFHORA this weekend for some hot laps on Saturday night and racing on Sunday. It promises to be a hotly contested race as some of So Cal’s best tuners and racers, of late, go up against the HOGGs on their home turf. This will be fray prep at it’s finest as So Cal faces off again against the Bay Area. All three of their fray teams will be represented as will all 3 of So Cal’s fray teams. I’m looking forward to some great racing and better camaraderie. It promises to lift the level of competition even more at the next fray. Come on down to Scott’s on Saturday, November 4th. Scott’s offered up 2 tickets to any out of town racer who’s willing to make the flight out and will put them up for the night as well, if needed. Contact myself or Scott for more details. A cool, late-April day and the allure of some heated competition, brought 13 racers to Greg Davis’ sweet, sweeping 4-lane Tomy creation â€¦. The Eastridge Raceway. A location that finds one only minutes from Southern California’s finest skiing, it was a long schlep for many of the racers but, undaunted, several drove 2-4 hours to face off on the trackâ€¦oh yes..AND for the opportunity to talk some trash! 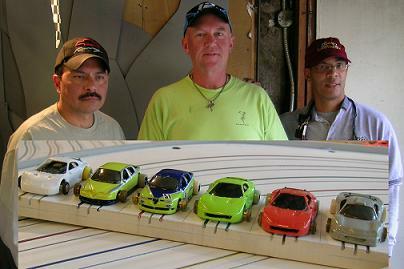 For the second consecutive race, GLENN GORDON from the AHORA gang in Arizona, joined in the competition. This time, he brought with him, a newcomer to our So Cal racing, a nice guy and good competitor, MICHAEL ALLBRIGHT, who would drive a Frayjet for his very first time. That was great to see. When you’re used to JL’s with slip-ons, a Frayjet is like a Formula 1 car! Watching Michael’s face on his first few frayjet laps was great. Welcome, Michaelâ€¦we’re glad to have you race with us! After a leisurely couple of hours of practice, it seemed as though everyone had an Old n’ Nasty car that was acceptable to race so, we decided to scrap the IROC format for this class. It was great to see all of these old school cars dukin’ it out! Admittedly, this class is swiftly becoming a favorite of this writer/racer, and several others. It’s great racing and the competition is fierce. After the flip of the coin to see which class would be run first, the racing began. The Old n’ Nasty Series was first. Since it was not going to be an IROC race, we decided to forego the qualifying and jump right into the racing. In an effort to give everybody good track time, we decided to run a big, long Round Robin, consisting of (4) 3-minute heats. The top 6 racers would move up to a Semi and a Final. As the racing began, heat totals were hovering in the 15-17 lap neighborhood. There were a few 13’s and 14’s, as well, and the dreaded Red lane became quickly recognized as ‘The Survival Lane’. About midway through the field, host GREG DAVIS stepped up to the track and turned up the heat, posting a 17 on Red, surrounded by a pair of 18’s and the day’s first 19, for a slammin’ 72 lap total! A few racers later, the only other 19 of the day was recorded by SCOTT DUNLAP, who finished closest to DAVIS but, still 3 laps back, with a 69. MICKEY HURTADO and FRANCIS MCENTEE were both right in the hunt as well, each with 68 laps. The last two to make the move up to the Semi-Final, were ROCKY GERMAN and ANDREW DAVIS, both posting 67 lap totals. Narrowly missing the move up were SCOTT ELLIS and, returning after a LONG layoff, TY BRITTAIN, both finishing with 66 laps. Welcome back TY! In the Semi-Final, the format changed to lap racing, with 10-lap heats. At the onset of the action, it was the younger DAVIS out to the early lead, taking the first heat and collecting 4 points. This young racer has come a long way in a short amount of time to become a racer that’s a major competitor and a force to be reckoned with. MCENTEE was just off the pace and took the runner up spot for the heat. In the next heat, GERMAN stepped up from an unlikely place, the Yellow gutter lane, to take heat #2. DAVIS was right behind and added 3 more points to his total. At this point of the race, MCENTEE was at the bottom of the heap with 4 points but, had yet to hit either of ‘The Money Lanes’. Once he did, he made his presence known, as he moved to the front and took first place on both the White and the Blue lane. MCENTEE’S efforts were just enough to sneak by DAVIS, as he took the top honors by a 12-11 score! Awesome run, Francis! HURTADO and GERMAN fought a hard battle but, both came up short, with 9 and 8 points, respectively. The Final/Main Event was set, as GREG DAVIS and DUNLAP entered the arena with MCENTEE and ANDREW DAVIS. Once again, it was A. DAVIS stepping up and capturing the first heat, from the White lane. G. DAVIS was right behind on the Yellow lane, capturing second place and 3 points. MCENTEE took the third spot and DUNLAP, on the survival lane, did just that, collecting 1 point for the fourth spot. At this point, G. DAVIS proceeded to ‘clean house’, posting two consecutive wins for 8 more points, and all but wrapped up a first place finish. In the last heat of the race, MCENTEE made his last effort to make the podium, which proved to be successful, by virtue of his first place finish on the White lane, giving him a total of 8 points and a tie with DUNLAP for the third spot on the podium. A. DAVIS ran a very consistent race as he quietly amassed 11 points, finishing off the DAVIS one-two punch. GREG DAVIS’ winning car was a sweet 1966 Ford Fairlane, from Johnny Lightning. The car was well tuned and looked as good as it ran! Congratulations, Greg, for a job well done! After a break for lunch, provided by Greg and his Mrs., (and I might add, quite a nice spread of homemade fried chicken, tater salad, and more! ), the qualifying for the Fray portion of the day began. This time, the race was in the IROC format and proved to be a good, close one. DAVIS, by virtue of his Old n’ Nasty win, was first to qualify. After a couple of laps to get up to speed, DAVIS set the mark, laying down a blazing 8.366 second lap. The younger DAVIS was next up and he laid down a very fast 8.577. A couple more racers laid down times in the high 8’s and the low 9’s, until DUNLAP stepped up with his speedy frayjet, and stole the ‘outside pole’ from ANDREW DAVIS, burning up the track with a lap of 8.480. MICKEY HURTADO was next up with a speedster of his own, posting an 8.888 (crazy 8’s) lap, making his the fourth car to be used in the race. That was a good plan until SCOTT ELLIS drove his Corvette to an 8.860 second lap, swiping the spot of the fourth IROC car by 28/1000 of a second! The qualifying was just a preview of what was to come in the race, with regards to how close so many of the drivers were. We tried something that was a bit confusing at the onset but, got easier as the race went on and proved to be a successful format. What that was, was an IROC round robin, comprised of timed heats (3 minutes each). Once we got the system figured out, it provided for an extremely close race. As racing began, most drivers were posting 18 and 19 lap heat totals. There were a few 20’s and then (guess who..) GREG DAVIS laid down the day’s only 21! When the round was over, DAVIS emerged as the winner of the round robin, with a 79 lap total, a full 3 laps ahead of EVERYBODY else! However, from second place on down the list, this was one of the closest battles that we’ve ever seen, as 10 of the remaining 12 drivers had between 74 and 76 laps. The move-up was not set until the final heat! The move-up was the top 6 finishers, with 3 thru 6 facing off in a Semi Final, with the top 2 finishers going to the Final/Main against the top 2 finishers from the round robin. Needless to say, DAVIS was sitting on top and had a bye, followed by a trip directly to the Main. The battle for that second ‘sit out’ spot was a great battle between the younger DAVIS and ROCKY GERMAN, both finishing with 76 laps, well on their way to 77. DAVIS prevailed by a matter of a few feet, and joined his dad to watch the Semi, where GERMAN would now have to keep his pace up to move into the Main. Joining GERMAN in the Semi, were 4th place round robin finisher, FRANCIS MCENTEE , with 76 laps, finishing just behind GERMAN, and 5th and 6th place finishers, MICKEY HURTADO and TY BRITTAIN, both with 75 laps. Missing the Semi by one lap or less were MICHAEL HURTADO, SCOTT DUNLAP, SCOTT ELLIS, MATT PAUL, and GLENN GORDON! That is 11 of 13 racers who could have made it to the Semi and or Main! How close do ya want it?!! In the Semi, the format went to lap races (10 per heat), with fray style scoring. As it began, GERMAN continued the pace he had established in the Round Robin, taking 3rd place on the 2 gutter lanes, accompanied by 1st place finishes on both of the middle lanes, totaling 12 points and enough to win the Semi and move up to the Main. Going into the last heat, that second move up spot was still undecided. Any of the other 3 drivers had a chance to make that move but, it was MCENTEE, rising to the occasion, capturing that last heat and the 4th spot in the Main. MCENTEE’S final heat burst, propelled him to an 11 point finish. BRITTAIN and HURTADO finished the battle with 9 and 8 points respectively. A great run for both of you racers and a special ‘attaboy’ goes out to BRITTAIN, for such a strong performance after such a long absence! This was a really fun, highly competitive race day that was enjoyed by all, regardless of finishing order. Everybody saw some good, close race action. Thanks to all who made the journey to Greg’s Garage. It was a class event and well worth the drive. Next race will be at Rick Jocham’s in May. C ya there! !